Many think that the world of acoustic guitars is fairly cut and dry and that there aren’t many differences in how the instruments are configured. There are so many things to consider, especially when looking to purchase. With an acoustic guitar, what you get is what you get. If you decide later that you don’t like the sound of the guitar, you can’t simply change the pickups like you can in an electric guitar. There are countless things that effect the sound of an acoustic guitar, some more important than others. The most important being the body style and the woods used to make the guitar. Smaller things like bracing and sound hole placement also have an effect on tonal characteristics. The body style of an acoustic guitar has a larger effect on how it will sound than anything else. One doesn’t necessarily sound better than another, but they do have very different characteristics. 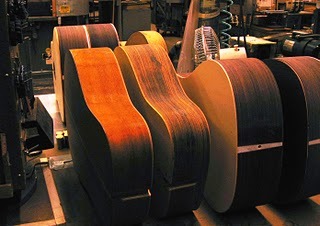 Body styles are commonly measured by the system Martin and Gibson pioneered in early acoustic guitar production. The smallest of the bodies is called a “single ought” which is written as a 0. They are more commonly referred to as a parlor guitar. The first Martin guitars built in the early 1800’s were this body style and were considered a large body at the time. They are ideal for fingerstyle playing and have stunning bell-like clarity especially in the higher registers. When it comes to volume, these won’t knock you out of your chair but are still very responsive to touch. They are almost always 12 fret which means the neck of the guitar meets the body at the twelfth fret. In most guitars, the neck meets the body at the fourteenth fret. The next size up, written as 00 is called the “double ought.” It is the same body style as the smaller single ought but is larger. These are also usually twelve fret guitars but there are a few fourteen fret models out there. These guitars also have an outstanding clarity and are capable of producing more volume than the smaller single ought. This body style is also ideal for fingerpicking but also can handle some moderately aggressive strumming. They are more bass responsive than a single ought as well. The next size, the 000 or “triple ought,” is also the same body style as the smaller 0 and 00 but larger still. They are very responsive and usually have rich bass and mid ranges. This body style is still very conducive to fingerstyle but can also handle very aggressive strumming and flat-picking. There are many models of both twelve and fourteen fret bodies available from different brands. The OM and OMC, which stands for “Orchestra Model” or “Orchestra Model Cutaway” are nearly identical to the 000, but have a longer scale length which is the distance between the nut and saddle. The two have almost identical tonal characteristics but some players prefer a longer or shorter scale length. The final and largest of the 0’s is the “M” which is 0000. The M usually has a 16” lower bout which is the area of the body below the bridge. The lower bout is where most of the sound is produced and rings from. The M is a very well rounded instrument that really does well with all styles of playing. It is still very clear and responsive for fingerstyle playing and can withstand the most aggressive strumming. This body style was the choice of superstar Eric Clapton when he played an M-36 to record his Unplugged album. This body style is very well balanced throughout the registers and if made with the right materials is one of the loudest body styles. The most popular body style is the Dreadnought. A flatpickers dream, the most popular of all production acoustics is the D-28. The dreadnought is very different from any of the 0’s. It is not choked down as much at the sound hole. Though not as well balanced as the 000 or M, the dreadnought is very bass responsive because the body is thicker. They are very punchy and cut through a mix well, especially for single note flat-picking. The dreadnought was not developed until the early 20th century and wasn’t mass produced by Martin until the early 30’s. Now, a pre-war D-45 (a Martin D-45 built before the end of WWII – 1945) in good shape can be valued at more than a hundred thousand dollars. The last body size I will talk about is the Jumbo body size. This body style is exactly as the name suggests. The jumbo is most often used for twelve string guitars but is also used frequently for six strings. Guitar manufactures, Gibson, and Guild are the most common users of the Jumbo body style. They have very rich bass and mids and can produce that “knock you of your chair” volume that some are looking for. They are ideal for all types of strumming but are as good for fingerpicking. The jumbo body style provides great volume but lacks in the crystal clear clarity that you get from the 0 style bodies. They are much clearer when used as a twelve string because the highs are far more present with the octave strings. The next very important thing to consider is the tonewoods used to make the guitar. There are endless possibilities of combinations and each produce unique tonal characteristics. Every piece of wood from the back sides and top, to the neck and fingerboard effect how an instrument will sound. Not only does the type of wood matter, but also the quality of the wood. The use of rare and exotic tonewoods significantly increases the cost of the instrument even if the woods are poor in quality. The back and sides of the guitar are usually made from a hardwood, the two most common being Rosewood and Mahogany. The top is usually a less dense wood like spruce or cedar though sometimes makers experiment using a harder wood for the top. The fingerboard is also usually a hardwood like Ebony or Rosewood but in some cases is a synthetic material. There are several different types of Rosewood used for making guitars; the most common is East Indian Rosewood. East Indian gives a very warm clear sound if paired with a spruce top, and provides rich bass response and volume. Honduran Rosewood is used less frequently and has similar properties to East Indian Rosewood. The most sought after Rosewood is Brazilian Rosewood. Thought of as the “holy grail” of tonewoods, it was heavily used before WWII on vintage instruments and is almost always paired with Adirondack spruce. It is becoming increasingly difficult to get a new guitar with Brazilian Rosewood because the tree is endangered and the U.S. has an embargo on its import. A quality piece of old growth Brazilian has stunning bass response and outstanding clarity if paired with a quality Adirondack top. If you can find a guitar with Brazilian Rosewood, you can expect to pay north of ten thousand dollars. There are a few alternatives to Brazilian that have similar characteristics and don’t come with quite as high a price tag. Cocobolo is a type of Rosewood that even looks similar to Brazilian with brilliant reds and oranges. It also provides wonderful clarity. Ziricote is another type of Rosewood that is also very similar to Brazilian. It has a similar grain pattern but has more yellows and grays than reds and oranges. Mahogany is the next most common wood used for back and sides. It provides a brighter sounding guitar than Rosewood and is often described as being very woody and natural sounding. It doesn’t have the punch that Rosewood does and doesn’t give quite as much volume. Hawaiian Koa is another type of Mahogany that grows only in Hawaii. Its tonal properties are in between Rosewood and traditional Mahogany. It is often used for Ukuleles. When paired with an Engelmann spruce top it makes for a sweet sounding fingerstyle guitar. It is often used as a top by Taylor which provides for a much darker sounding instrument but is stunning to look at. Korina is another type of Mahogany that is used on rare occasions but is more commonly used for electric guitar bodies. Some less commonly used woods are Maple, Walnut, and Ebony. Maple makes for a very bright sounding guitar with less bass response, and is often used for Jumbo guitars to help the clarity lost by the body style. Ebony is a dense wood similar to Rosewood but is almost black in color. Walnut is a good all purpose wood that has good qualities from both Rosewood and Mahogany but is not used very often. The top of a guitar is called the soundboard and is usually always a type of spruce. The top needs to be less dense to allow the sound to come through it. The most common type of spruce used is Sitka spruce. The grain of Sitka is very dark and usually very straight. Sitka is a good top for those who like to strum aggressively because it is the densest of the spruce family. Engelmann spruce is a much lighter grained spruce that is often paired with Koa or Maple. It is clearer and responds better than Sitka. It is a good top for fingerstlye players. Adirondack spruce, also known as red spruce is the top of choice for premier guitars. Many say it doesn’t get any better than Brazilian rosewood matched with Adirondack spruce. It is considered a premium tonewood and quality pieces are becoming more and more scarce. It provides a clearer and punchier tone than Sitka which makes for a great flat-picking top, but is also very responsive to a lighter touch for fingerstyle or classical. Some less commonly used tops are; Western red cedar, German spruce, Carpathian Spruce, and Redwood. The last thing to consider is the materials that make up the rest of the guitar. Little things can very subtly change the sound of the guitar. The first is the fingerboard. If the fingerboard is made from a hardwood like Rosewood or ebony, the guitar will have better sustain than if made from a synthetic material or Micarta. The nut and saddle are also important. The standard for premium guitars is bone. Many are also a type of tusk. If the nut and saddle are made from plastic it will effect sustain. Last but not least, the bracing of the guitar has an effect on the sound as well. Most of bracing falls into to two categories. Straight bracing, and scalloped bracing. Scalloped bracing gives superior resonance because the braces are shaved down. The soundboard has to be braced to provide the strength needed to support the tension of the strings. This means extra wood which can dampen the sound. With scalloped bracing, there is less wood without sacrificing any strength. Scalloped bracing was used in prewar Martins and is still used in higher end instruments. All these things play a major role in the tonal characteristics of the guitar. Everything from type and quality of tonewoods down to the way the top is braced, no matter how subtly, effects how the guitar will sound. Everyone has different tastes as to what sounds great, and the only way to find out is to try as many different combinations as you can get your hands on. Happy strumming.